By respecting time-honoured traditions from east to west, the highest levels of integrity are manifested in every Tengri product. For thousands of years, nomadic herders have stewarded the land and animals in the remote Khangai Mountains of Mongolia, where semi-wild Khangai Yak roam the grassland steppes. In Britain, the rolling hills, gentle valleys, picturesque villages and mineral-rich waters of Scotland and Yorkshire have enabled generations of craftspeople to create the finest woollen yarns and luxurious fabrics for over 400 years. The rolling hills, picturesque villages and mineral-rich waters of Scotland and Yorkshire. In Mongolia, Tengri works directly with nomadic herders who hand-comb each baby yak once a year, when they shed their first winter coat. Only 100 grammes of precious virgin Khangai Yak fibres is available each spring. These fibres are hand-sorted into four natural colours: cocoa, tan, and the rare, extremely valuable silver and platinum. Hand-combing the yak individually, once a year, when the animals shed their winter coats. On average, only about 100g of virgin fibres is available from each yak, every year. The world’s softest, rarest yak fibres can be hand-combed only once – from Baby Khangai Yaks. The fibres are as soft as cashmere, warmer than merino wool, light and breathable, hypoallergenic, and resistant to moths, pilling, water and odours. Moreover, these fibres have the strength and durability associated with cervelt (red deer down). Although Khangai Yaks are combed more often than vicuña (annually compared with every three years for vicuña), the comparable fibre yield is less, making baby Khangai Yak fibres rarer than vicuña. 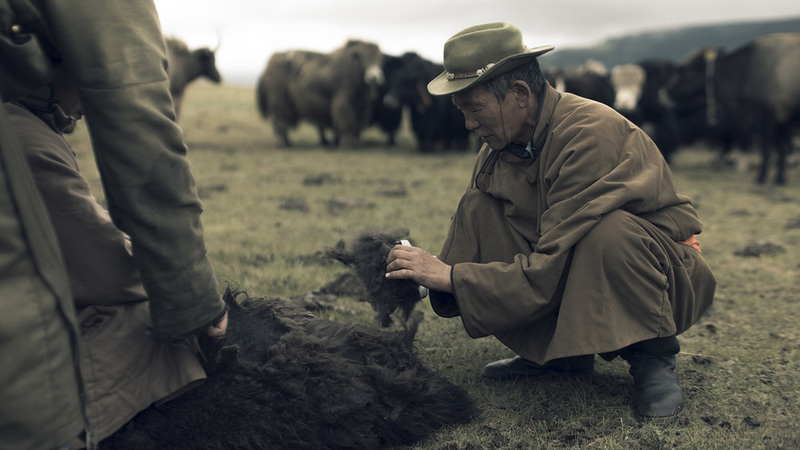 Tengri's Khangai Noble Yarns® support an indigenous species of Khangai mountain yak, helping to protect and support biodiversity and enabling other wildlife to thrive. After combing, the fibres are hand-sorted into different grades, washed in gentle soap and water and dried, before being spun into Tengri Noble Yarns and Fabrics. Tiny fluctuations in overnight temperatures intensify the growth of Mongolia’s softest yak down on the animals’ underbellies. These fibres have outstanding thermal-regulating properties, enabling Khangai Yak to thrive in scorching summers and bitter winters (temperatures range from +40 to -40 degrees Celsius). The Khangai region's microclimate contributes to the unique qualities of Khangai Yak coats. The natural colours of the Khangai Noble Yaks: cocoa, tan, and the rare, extremely valuable silver and platinum. The untreated and undyed condition of Tengri Noble Fibre® makes it ideal for those with allergies. Our garments represent the natural colours of the Khangai Noble Yak. Tengri Khangai Noble Yarns are spun and woven into fabric in Yorkshire, at a family-owned mill where skills are passed from one generation to the next, and where textile manufacturing dates back to 1777. To create yarns and fabrics of the highest quality, we combine the latest innovations in textile research and development with centuries of traditional craftsmanship. Making Tengri fabric requires creative artistry and science, combining the best raw fibres and yarn construction to create a single ream of luxurious cloth. We use natural processes with just water and soap to create a natural finish. The mineral-rich and soft Pennine waters that are unique to Yorkshire in the north of England are used to finish our cloths. The water helps to ‘burst’ our Khangai Noble Fibres, giving the cloth its distinguished luxurious handle and understated elegance. To finish our cloths, we use natural methods such as brushing the fabric with wild harvested thistle-like teasel plants. Finally, a gentle steam is applied to the fabric, resulting in a cloth with a soft texture that creates a beautiful drape. Our development technology, applied to fibres from the Khangai Yak, ensures that every Tengri garment is exquisitely soft, light, warmer than merino wool, hypoallergenic and durable. Our applied Noble Yarn Technology ensures that every garment is naturally resistant to water and moth. The Tengri Innovation Award was launched in 2018 to encourage the implementation of sustainable fashion and textiles working towards a more sustainable industry standard and future. Tengri, listed in Sustainia100 as one of the world’s leading sustainable business solutions, produces Khangai Noble Fibres® via a 100 percent transparent supply chain. 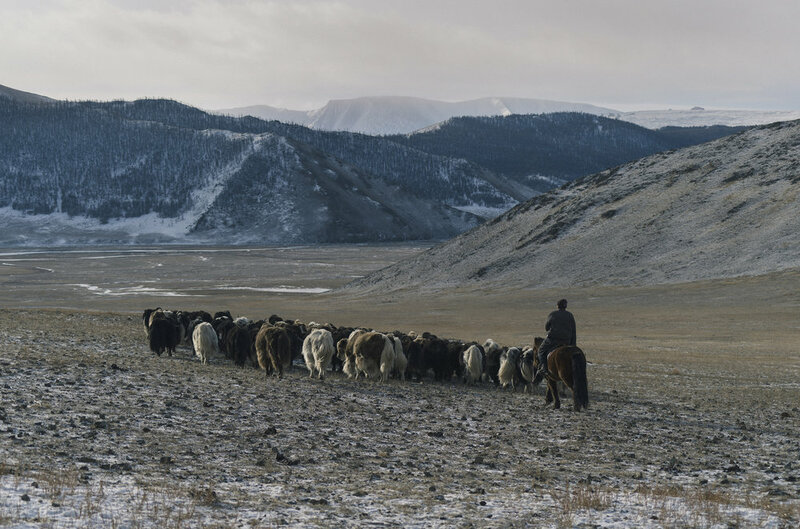 We source our yak fibres directly from cooperatives made up of more than 4,500 herder families living in and around Mongolia’s Khangai Mountains. The garments and yarns we create embrace the unique qualities of this very special fibre – qualities often under-recognised in the global textile industry. According to the United Nations Development Programme, 90 percent of Mongolia is fragile dry-land – desertification threatens wildlife and biodiversity. Tengri’s social enterprise with nomadic herders supports United Nations Sustainable Development Goals by promoting sustainable economic growth, ensuring sustainable production patterns, protecting and promoting sustainable natural ecosystems use, and combating desertification through our global partnerships for sustainable development. Discover more about how we do business here. Tengri founder Nancy Johnston with a herder family in the Khangai region of Mongolia. Contract signed with leader of the cooperatives (representing more than 4,500 herder families). The creation of Tengri fabrics is phased in line with nature’s timing. It all starts when the baby Khangai Yaks shed their first winter coats – just 100 grammes of Khangai Noble Fibres is collected from each yak. With such an extremely limited supply, the journey from fibre to fabrics and a Tengri collection can take up to 24 months. From accessories and home products to classic statement pieces with a modern and relaxed aesthetic, Tengri offers truly exclusive yet sustainable luxury. Fringed Blanket – our deluxe, super soft, Cocoa blanket with a luxurious smooth handle. Classic Crew Sweater – a lightweight sweater, hand-loomed in Scotland.